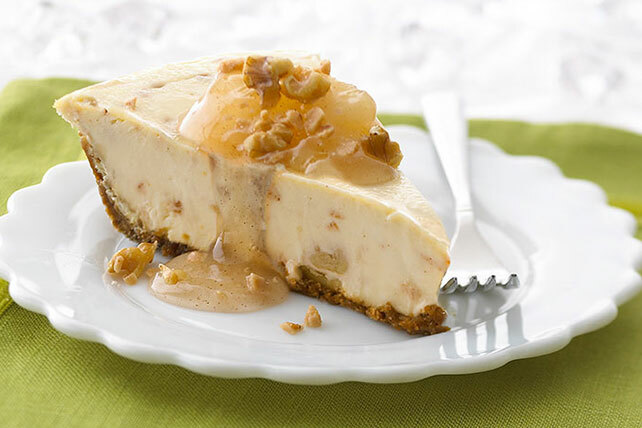 The ultimate cheesecake for apple pie lovers—with apple pie filling, walnuts and toffee bits, all in a ginger snap crust. Mix crumbs, butter and 2 Tbsp. sugar; press onto bottom and up side of 9-inch pie plate. Beat cream cheese, 1/2 cup sugar and vanilla with mixer until blended. Add sour cream; mix well. Add eggs, 1 at a time, beating just until blended after each. Stir in 1/2 each pie filling, nuts and toffee. Pour into crust. Bake 35 min. or until center is almost set. Cool. Refrigerate 4 hours. Top with remaining pie filling, nuts and toffee before serving. Save 50 calories and 6 grams of fat per serving by preparing as directed with PHILADELPHIA Neufchatel Cheese and BREAKSTONE'S Reduced Fat or KNUDSEN'S LITE Sour Cream. Prepare using chocolate-covered toffee bits.